Headboard, FootBoard, Rails, Slats, Dresser, Mirror, Chest and Nightstand. We can seperate sets or add pieces if needed. New Truckload of Brand New mattresses and Furniture has just arrived. 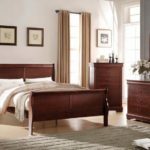 Named brands like Ashley, Simmons, United Furniture, Royal Heritage, Sealy, Natures Sleep, Klassner, Steve Silver. Save 30-70% Off Regular list prices !!! Stop into the clearance center at 1701 N Dirksen Parkway in Springfield IL and check us out ! !